WiggleDoodle: Where in the World???? Okay, it's been more than a month since I last updated my blog and I must admit a lot of things have happened. Pope John Paul II got sick and died but a new one, Pope Benedict XVI has taken his place. That's one thing I like about the Church I am in. There is this continuity and constancy, two things that reassure me that whatever happens, life will continue. Then there was that great quake that never was! A text message (SMS in other lands) spread in the metropolis alleging that a visionary nun foresaw a massive intensity-9 earthquake that will hit Metro Manila on April 14 at 5PM. Our panic-striken boss sent us home only to see us having a great time at a nearby mall 30 minutes after the supposedly earthquake. Well, I haven't fully explained my disappearance, have I? Okay it is simple. I've been very busy. With work? Are you serious!?! With my The SIMS2 of course. I created a lot of characters and everyone is demanding attention from me. One recently died because of old age and is now scaring the wits out of her fellow sims by her nightly hauntings. Then I've been busy with the darn baby SIM which resulted from a couple of my SIMS trying out for a baby. I will never do that again of course. So this lengthly post is just an announcement that I am back. Hopefully on a regular basis. Wait... Oh one of my SIMS needs to take a shower. See you later. 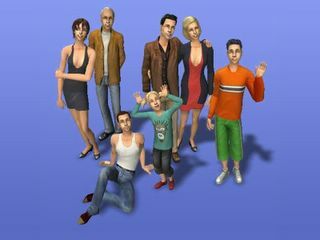 Here's the picture perfect SIMS family I am working on!